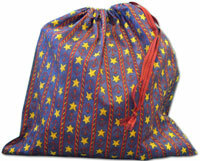 Store all of your shopping purchases in this roomy tote. It has 2 large front pockets and up to 3 zippered outside back pockets. Inside this midsized tote you will find a mini sized purse for all your essentials that stays safely secured in place until you want to take it out for a night on the town. Don't worry about changing purses for the evening; everything you need is already in place in your hidden mini purse. Remove the mini purse to find a shoulder length strap tucked inside a back pocket. This mini purse has 2 outside pockets and closes at the top with a zipper. Place it back in the tote and you are ready for more shopping tomorrow. Leave your bulky bags behind and take these small wonders with you. 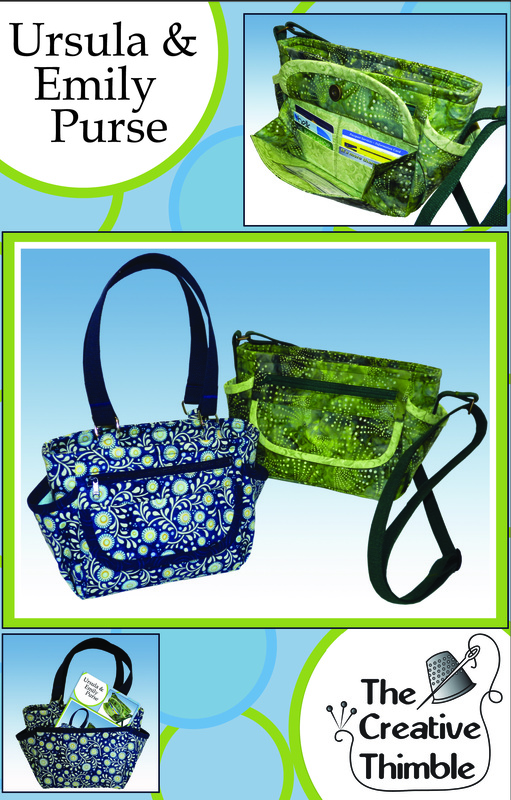 Ursula and Emily are small sized purses with all the pockets you could ask for. Open the magnetic flap on the front to reveal 6 credit card slots and one ID window. Also up front is a zip pocket large enough to hold paper money. On the back there is a slash pocket the full width of the purse to hold coupons and receipts and on the sides are pouch pockets for sunglasses, phone or water bottle. The lining includes another zip pocket and two patch pockets. The purse closes across the top with a zipper. Ursula has an adjustable handle that can be worn across the body or on the shoulder and Emily (Ursula's alter ego) has dual shorter handles. Make one for yourself. You'll enjoy it so much, you'll make some for your family and friends! Take a look at all of our designs and Creative Thimbles easy order process. 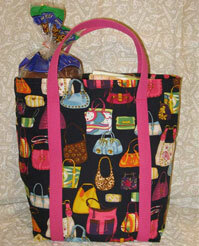 who turned her lifelong passion into creating sewing patterns for purses, handbags and totes. Click on each image to download the pattern. Join in making Troop Bags. This is a national 501C3 non-profit charity that fills and sends the filled bags monthly to our troops. The request is for a 14" Drawstring Bag that will hold a one gallon size "baggie". The bags are filled with toiletries and they are used for personal use, and some pass them on the children in the area where they are located. The lightweight cotton bags can be sewn up in any color, but please keep in mind that the majority of troops are men, so masculine colors and prints are recommended. No more paper or plastic bags for shopping!! Here is a pattern to get you going. They sew up in about an hour for your first one and faster after that. They're so fast to make, you will be making them for all your friends. Quick and Easy Zippered Accessory Patterns. 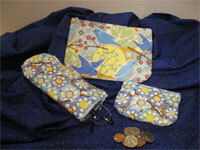 Eyeglass case, Cosmetic bag and Change purse. 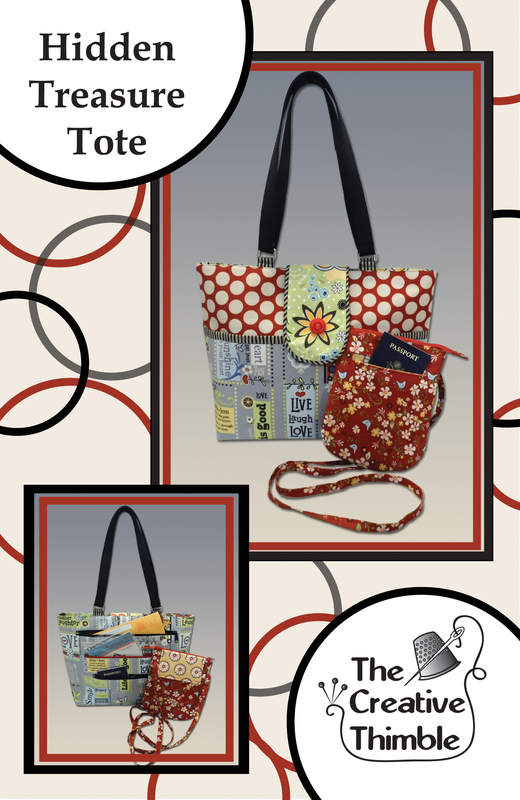 A great way to use up the leftover fabric from your purse or tote project.